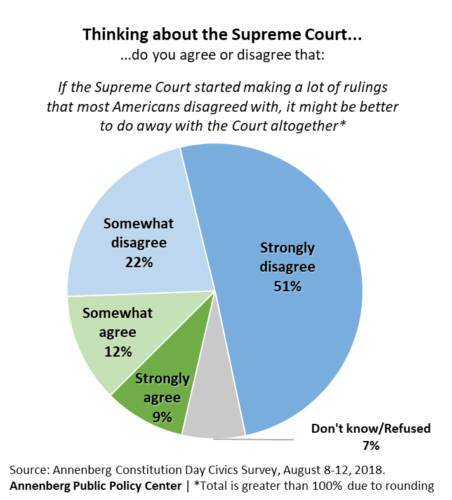 The annual Annenberg Constitution Day Civics Survey, conducted in August among more than a thousand U.S. adults, found that Americans are familiar with constitutional provisions involving impeachment and pardons, issues that are in the news. But they know less about fundamentals like the three branches of government. 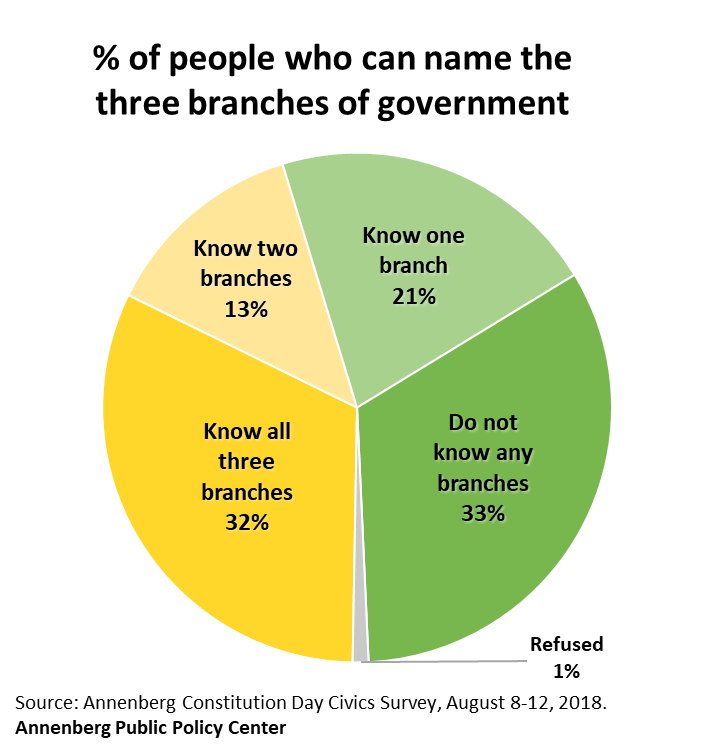 This year 32 percent of Americans were able to correctly name all three branches, an increase from last year’s 26 percent and the highest since 2014, when it was 36 percent. The rise may reflect greater awareness after a year of nonstop political news about the president, Congress, and the Supreme Court – the executive, legislative, and judicial branches. The portion of respondents who couldn’t name any of the three branches was unchanged, at 33 percent. But a slim majority (55 percent) knows that a 5-4 Supreme Court decision is the law and must be followed, about the same as last year. And 68 percent know that the Constitution gives the president the power to grant pardons for offenses against the United States. The survey found a significant relationship between constitutional knowledge and protecting the Supreme Court. An analysis of responses to four of the key knowledge questions found that people who correctly answered all four strongly opposed weakening or getting rid of the court. Those items concerned the names of the three branches; what it takes for Congress to override a veto; who confirms a Supreme Court justice; and what a 5-4 Supreme Court ruling means. “We found a direct relationship between basic knowledge about the three branches of government and wanting to protect the independence of the courts,” said APPC distinguished research fellow Bruce Hardy, an assistant professor of communication and social influence at Temple University. Jamieson said, “The survey shows the important role that understanding of the Constitution plays in the public’s support for an independent judiciary. 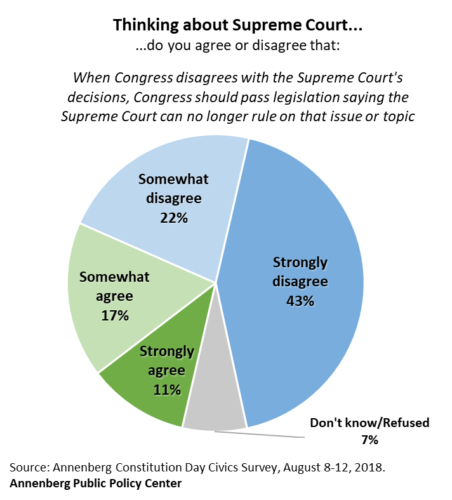 But it is worrisome both that 1 in 5 would consider doing away with the Supreme Court if it were to issue a lot of unpopular decisions and that 1 in 4 think it would be OK for Congress to strip jurisdiction from the court in instances in which it disagrees with the court’s ruling. CRN and its members sponsor the Preamble Challenge, in which teachers, classes and citizens recite, perform, and celebrate the 52-word Preamble to the Constitution. Annenberg Classroom has released the short video “The Supremacy Clause: McCulloch v. Maryland” exploring the tension between states and the federal government through this landmark Supreme Court case. See CRN’s partners for more about Constitution Day. Follow the Civics Renewal Network on Twitter at @CivicsRenewal. Coming soon: Next month the Annenberg Public Policy Center, home of Annenberg Classroom and FactCheck.org, and iCivics will release a media literacy game for secondary school students through adults, teaching them how to confirm information and identify misinformation.